All Menudo Run proceeds benefit the Nevada State College Scholarship Fund! Finishers medals to all 10K & 5K runners; finishers ribbons to all 1-Mile fun walkers. Custom Menudo Run t-shirts to all participants in all events. 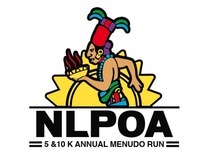 Thank you for registering for the Annual National Latino Police Officers Association Menudo Run 10K, 5K & 1-Mile Fun Walk. Saturday, May 6, 2017, 10:00 a.m. - 6:00 p.m.